From the international Lisbon Airport: Chill in Ericeira Surfhouse is just about 30/40 min by car. We provide transfer from and to the Lisbon airport for 60 euros one person to 3 people. Alternatively the cheapest way is coming by bus from Campo Grande bus station with the buses of the Mafrense company. Chill in Ericeira Surfhouse is made up by two houses from 1960s that stand in front of each other separated by the typical portuguese cobble stone road. 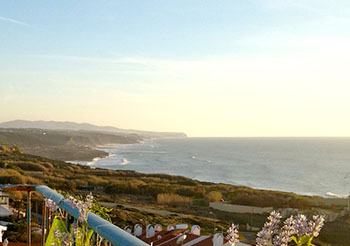 Ericeira is also known for its warm and welcoming people that love to receive surfers and travellers all year. You'll fall in love for the fresh fish brought in every morning by the fishermen, the natural beauty of the surroundings and the magic of Ericeira night life. There are six world-class waves within 4 Km range: Pedra Branca, Reef, Ribeira d'Ilhas, Cave, Crazy Left and Coxos, plus along the 11Km of coastline, you'll find a total of 22 very consistent surf spots with different characteristics, perfect for surfers of all levels, from beginner to professional. With us you'll feel like a real local surfer!! We take you to the more suitable beaches for your level of surfing and the best spots to enjoy the night.